Weimaraner puppy grooming starts the minute you bring your new puppy home, whether you are grooming your own dog or you use a professional dog groomer. Simple activities help your puppy get ready for grooming. Handle your new puppy and help him get used to being touched. This is fun to do, and you can’t start too early. so that he will be comfortable with being groomed. These activities will help you and your new puppy get used to working together. 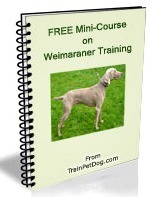 They will help make Weimaraner puppy grooming fun for both of you. Handle your puppy – and touch him. This is called desensitization. Get him used to having you touch his paws, his head, his ears and his stomach. Touching him will become a normal activity–not something to be afraid of. This is important to do, as it will help your puppy feel comfortable when touched by the vet, the dog groomer or even small children who might be a little rough. 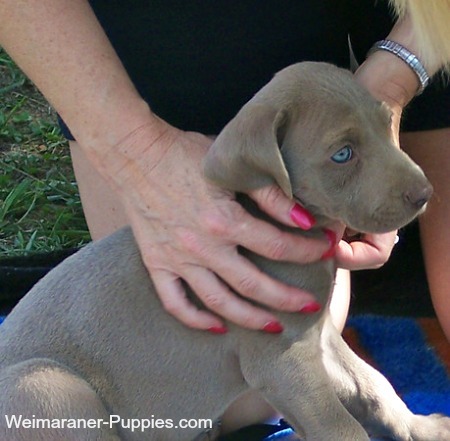 Brush your Weimaraner puppy – Hold your puppy in your lap and brush him. He will probably wiggle and squirm, at first. Don’t stop. Brush him gently until you’ve brushed half of him. Then, end the session with a (very soft) brushing on his tummy or a firmer brushing, just behind his ears (an itchy place for many dogs). Sit on the floor with him – As your Weimaraner puppy grows, place a blanket on the floor, and sit next to him. Weimaraner puppies grow fast! Your puppy will soon be too big for your lap! With large dogs like Weimaraners, grooming your dog is most easily done on the floor–unless you have a special dog grooming table. Get ready for dog clippers – Get your puppy used to vibrations and sound by taking a household object (like an electric shaver) and touching your puppy briefly in very short sessions. Your puppy will get used to the vibrations and sound (like dog clippers) and won’t be as frightened when approached by the pet groomer (or you). Flipping your puppy – Many dogs are frightened when they are lying down and someone flips them to the opposite side. Practice doing this with your puppy when she is still small. Being able to flip her to the other side will be helpful when you groom her (or the pet groomer does), or when the veterinarian wants to see her other side. If you will be grooming your own dog, now is the time to investigate dog grooming videos and dog grooming books so that you can learn how to groom your Weim. Weimaraner puppy grooming is quite easy. Weimaraners are truly low maintenance dogs, and, this is a good thing. You’ll find that afternoons of romping through the woods will result in burrs in your dog’s hair, tangles and even pests like ticks. Knowing how to groom your own dog will save you money, and it will come in handy when you bring a muddy, tired and happy dog home from a day of hunting or playing. At any rate, it won’t be long before your new puppy is ready for his first real dog grooming session! That’s all there is to it! If you start getting your Weimaraner puppy used to these pre-grooming activities, your new puppy will just accept being handled by people, as being natural. And your Weimaraner puppy grooming will be a cinch!